This topic contains 17 replies, has 4 voices, and was last updated by Nicole 3 years ago. I am in the middle of sewing the Garden Party blouse in size 12 using some pretty Liberty Lawn I picked up on sale recently. 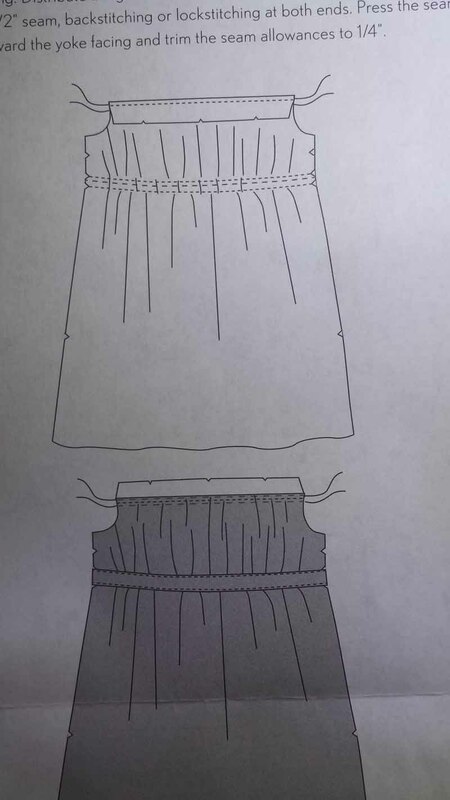 The illustration on page 2, bottom of column 4 shows the front skirt pattern with 2 notches at the top on each side with the corresponding 2 dots centered between the notches across the waist. 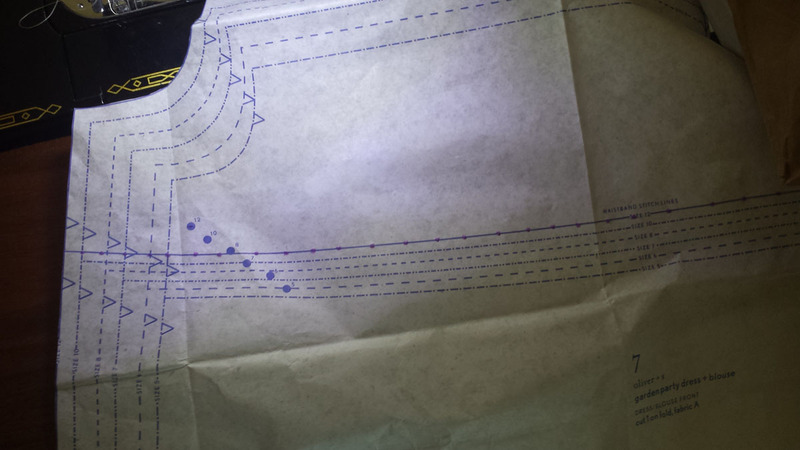 However, the pattern has the dots spaced a half inch above the stitching line. However, on page 3, columns 1 and 2 show 3 notches on that section with the waistband centered between the bottom two notches (column 2), with the 3rd set of notches towards the top of both sides above the waistband. 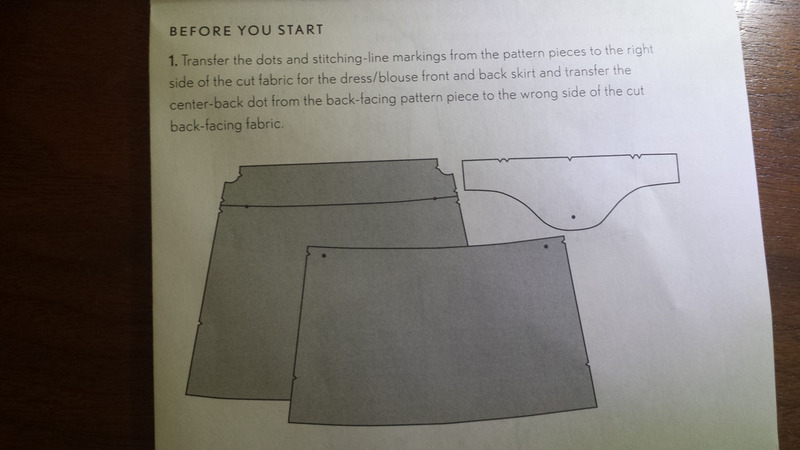 Yet, when I double-checked the pattern piece there are only two notches with the two dots in line with the top of those two side notches. My question, therefore, begins with the instructions on page 2, column 4. Where do I start stitching that first line of basting stitches? On the line? 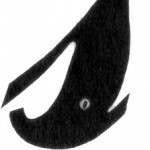 Or starting at the dots (drawing a line between them?) and sewing between those dots first (then stitching 3/8 inch on either side of that)? Hoping this is a clear explanation. Thanks so much for your time on this. I’m afraid I haven’t made this one — hopefully somebody who has will be along soon to chime in! Here are the photos of the pattern and pattern instructions so hopefully it will make more sense what I’m trying to explain. Last photo of the pattern piece. I am a bit tired today,( Trixie had jabs yesterday and didn’t sleep that well last night) but if I link to my blog post http://fiveandcounting-motherof5.blogspot.com.au/2014/03/the-garden-party-tutorial-part-one.html maybe you can see the notches in that? I am sorry not to be more help….. I am a wee bit fuzzy headed today. Just found your Part 2. 🙂 I noticed you made the smaller size so I wonder if this is significant to the larger sizes. Have you or anyone else made it in the larger sizes yet? What did you do? I have not made the larger size but there have been a lot in the Flickr pool. Thanks, Nicole. I have it set aside. With Liberty I am a bit nervous to proceed without knowing for sure. With how fine it is, I don’t want to puncture the fabric too many times if I am wrong. I feel so out of practice. 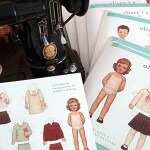 @April Henry, I am planning on making this soon in the size 8 as part of a sewing swop. I have 27 drawstring bags to make for the school and it is next, after that project. April, stitch the first row of basting along the line you transferred, just as it says in the instructions. 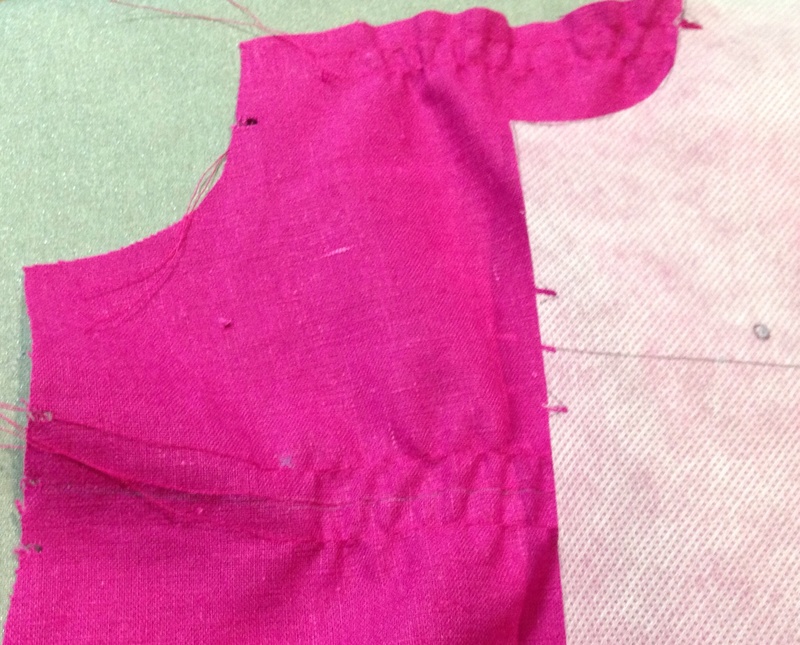 The dot shows where to begin and end the basting/gathering so the gathers won’t continue into the side seam or seam allowances. It’s been a long time since I wrote this pattern, but looking at it now it appears that the dot really could have been dropped by 1/2″ so it sits directly on the line. I don’t recall why it’s higher than the line–maybe so you can see it when you pin the waistband over the gathering stitches? I think I’d need to make it again to refresh my memory! This reply was modified 3 years ago by Nicole. 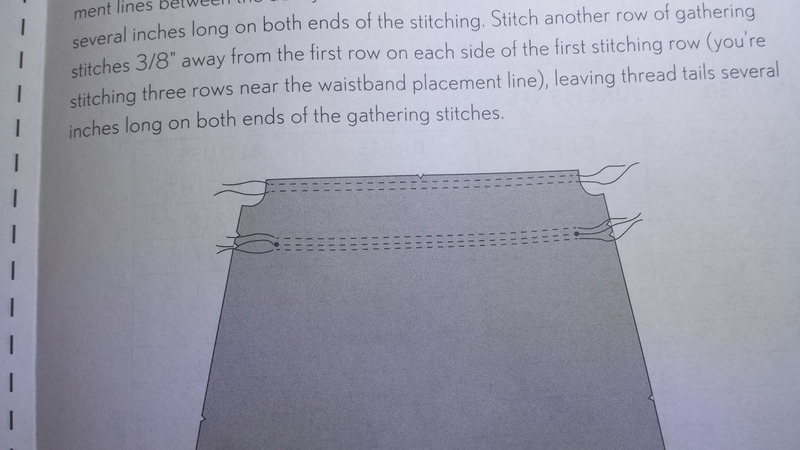 Sounds good… just so I am clear, though, I don’t stitch on the area between the dots but on the stitching line I transfer from the pattern piece (even though the illustrations in the instructions show a stitching line on the area between the dots)? Also, what do I do about the 3rd notch that’s in the illustrations but not on the pattern piece? 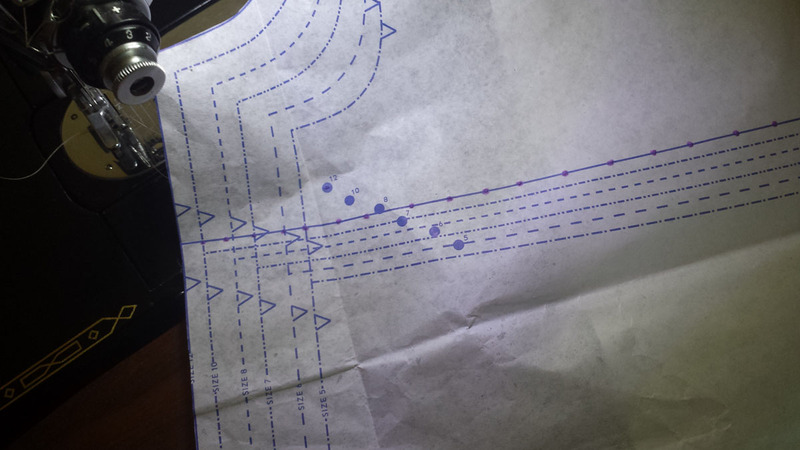 Is there a measurement I can use to add it to my pattern for future reference and alignment?